And the wait if finally over… The unparalleled king of bridal couture, Sabyasachi Mukherjee, weaves his magic once again! This time over, the ace designer takes us to his world, reminiscent of an era long gone by launching the Sabyasachi Jewellery line, the first of its kind! 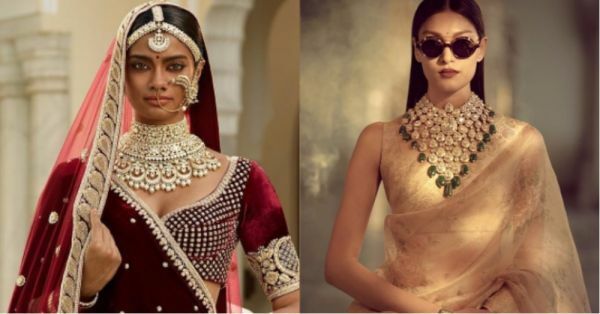 Shot aesthetically at Jaipur’s Rambagh Palace, the Sabyasachi Autumn-Winter 2017 Couture & Jewelry Collection is nothing short of breathtaking. Beautiful, classic designs that have been handcrafted, dominate Sabya’s new collection, which is a mix of diamonds, gold and jadau. His inspiration comes from the twenties, from women like Frida Kahlo, Amrita Sher-Gil, Édith Piaf and Devika Rani. This bridal wear line is exquisite to say in the least. In the Rani Sahiba’s Diamonds collection, you can find everything, right from the Golconda Diamond necklace to the Pestonjee earrings. The Baroda Collection has beautiful naths, maangtikaas, necklaces and chokers. This is royalty at its best! But wait a minute. Sabya is not done yet… The Heritage Collection has the classic polki Rani Haar to the jadau chokers. We simply love everything Sabyasachi. There’s also something in store for the simple, understated yet stylish man. Sabya has also come up with the Sabyasachi black silk-textured sherwani with hand-crafted gold plated buttons – A House Classic. But that’s not all. The designer has even crafted necklaces for men, like the classic multi-strand of yellow Sapphire beads. Brides can also go ga ga on Sabya’s Devi and Gulkand Bridal Couture 2017 Collection. This Champakali Lehenga from the Devi collection is a beautiful mix of aari, zardosi and applique techniques dexterously applied on kumkum red raw silk. The Gulkand Collection will have you drooling, take a look! The Gulkand Collection will have you drooling, take a look! So for all the brides wanting their hands on some Sabya Jewellery, start saving up already to get your hands on at least one of these absolutely stunning pieces! We know we are!